As states continue to implement various aspects of the Affordable Care Act (ACA), developing and expanding home and community-based alternatives to institutional care remains a priority for many state Medicaid programs. 2013 marked the first time that home and community-based services (HCBS) accounted for the majority of national Medicaid long-term services and supports (LTSS) dollars (51%), increasing from 18 percent in 1995.0F1 State Medicaid programs are operating in an environment of sustained economic improvement and as of 2015, continue to face the competing priorities of implementing the ACA’s streamlined eligibility and enrollment processes, determining whether to adopt the ACA’s Medicaid expansion, and pursuing a variety of delivery and payment system reforms. States also continue to have access to some of ACA’s new and expanded LTSS options, some of which offer enhanced federal matching funds, to expand beneficiary access to Medicaid HCBS. Ng, T., Harrington, C., Musumeci, M., and Reaves, E. L. November 2015. 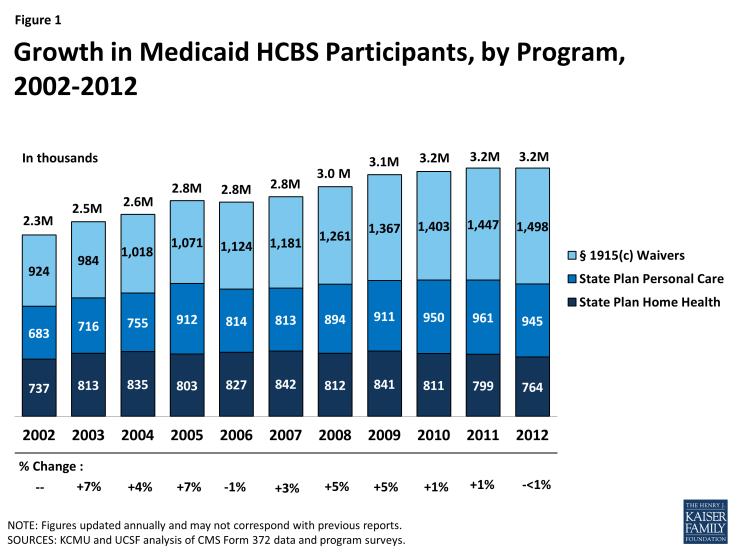 Medicaid Home and Community-Based Services Programs: 2012 Data Update. Kaiser Family Foundation.